I’m a bioengineering PhD candidate at Stanford University, California, US. My work tries to better understand the biomechanical and neurological mechanisms underlying motor symptoms in Parkinson’s. At university, I was absolutely fascinated to learn about how the brain works – and also what happens when it doesn’t work. I love to be active and outside as much as possible and so I wanted to help those whose mobility had been taken from them. What is The Parkinson’s Story Exchange? 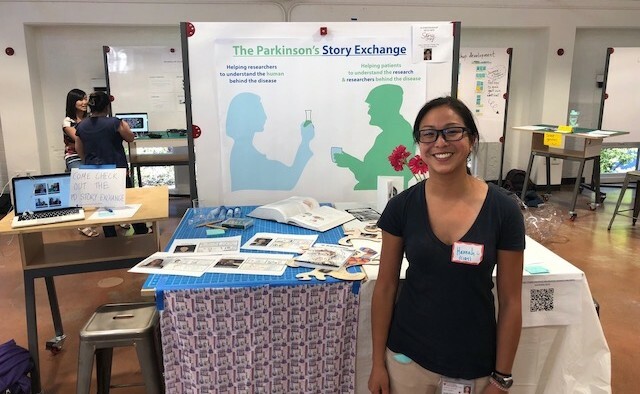 The Parkinson’s Story Exchange is an initiative that seeks to increase empathy between Parkinson’s researchers and people affected by the condition. It was created in partnership with StoryCorps – a US non-profit organisation with a mission to record, preserve and share the stories of Americans. It mainly involves 40-minute audio recordings where people can share whatever they want. Often, they share life stories and experiences that make them smile, laugh and even cry. Anyone can take part. We have had people living with the condition, campaigners who run Parkinson’s exercise programmes and also staff from Stanford University. My main aims were to give people a platform to share their stories – or record them to keep for themselves and their family. Some of the stories are available on the Stanford University website so that researchers can listen and get a better idea of the humans behind the condition. The website also features cartoon profiles of our research team to help give people with Parkinson’s a better idea of who they are. Have you been personally affected by Parkinson’s? My initial motivation for the project was through my mum. She worked at a nursing home when we were growing up and I would always make the rounds with her at night, where she would stop and talk to each and every resident before leaving. I was always annoyed that we had to take the time to do this before going home – and it wasn’t until I got older that I realised why she did this. People just need to be heard, she would always say, especially when you’re older – it’s so valuable to have someone listening. I started to have the same experience when I talked to people here at Stanford University. I realised how special it was to connect with people affected by Parkinson’s. What do the interviewees talk about? Often people will openly talk about their Parkinson’s, but I never ask anyone directly to talk about it – especially if they don’t want to. Parkinson’s is a significant part of most people’s recordings and they weave it into their story as they talk. It’s not more significant, however, than when people talk about their families or their careers or accomplishments or most embarrassing moments. People’s stories really colour their lives and I love to listen and see it all play out. What has been the response from the people who have taken part in The Parkinson’s Story Exchange? It’s been overwhelmingly positive. I cannot be thankful enough for all of the people I have met through this project. Recording these stories is always the best part of my day! I constantly receive emails from people saying they are still thinking about the experience and are forever changed. They treasure their stories and report sharing them with family and friends. Why is it important to increase empathy between researchers and patients? Understanding a disease on a molecular or cellular level is absolutely fascinating and wholly important for research progress. However, the reason why we are studying Parkinson’s in the first place is to help humans living with it. I think getting deep into the research can cause you to forget this. If I wasn’t reminded daily about how Parkinson’s affects people, then I think I might have a different perspective on my work. I hope to give other researchers the same experience. When you listen to another person’s story and hear how their voice changes when they talk about an experience, your humanness takes over and you empathise. I also want patients to see the people that are working hard to help them, and understand the research going on in the field. I want to continue to collect stories locally at Stanford, but also recruit people nationwide, and even worldwide. I think this project could translate well to other researchers and diseases – and I hope to share this model so that more people can start having conversations. How will ‘Brexit’ affect Parkinson’s research in the UK? What next for Parkinson’s research funding after the UK leaves the EU?